Doris Janzen Longacre was born 15 February 1940 in Newton, Kansas. She received her BA degree in home economics from Goshen College and did graduate studies at Goshen Biblical Seminary and Kansas State U. With her husband, Paul Longacre, and two daughters, Cara Sue and Marta Joy, she worked with Mennonite Central Committee in Vietnam (1964-1967) and in Indonesia (1971-1972). She served as chairperson of the Akron Mennonite Church, as a member of the Board of Overseers of Goshen Biblical Seminary, and as a frequent speaker on world hunger. "More-with-Less" came to be associated with Doris through two books she compiled as part of a Mennonite Central Committee assignment. The More-with-Less Cookbook, a collection of recipes and suggestions on how to enjoy more while consuming less of the world's resources, was published in 1976 (Scottdale). It was sold widely, both within and outside Mennonite circles and was translated and adapted for publication in German. Doris died of cancer on 10 November 1979 just months before the completion of her second book, Living More with Less (Scottdale, 1980). This book, filled with personal testimonies of people searching for ways to simplify their living, was a tribute to Doris' lifelong quest for ways to live responsibly and joyfully in a world neighborhood. 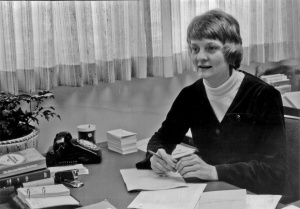 Doris Janzen Longacre site at Herald Press. Martin, Pat Hostetter. "Longacre, Doris Janzen (1940-1979)." Global Anabaptist Mennonite Encyclopedia Online. 1987. Web. 19 Apr 2019. http://gameo.org/index.php?title=Longacre,_Doris_Janzen_(1940-1979)&oldid=92465. Martin, Pat Hostetter. (1987). Longacre, Doris Janzen (1940-1979). Global Anabaptist Mennonite Encyclopedia Online. Retrieved 19 April 2019, from http://gameo.org/index.php?title=Longacre,_Doris_Janzen_(1940-1979)&oldid=92465. Adapted by permission of Herald Press, Harrisonburg, Virginia, from Mennonite Encyclopedia, Vol. 5, pp. 529-530. All rights reserved. This page was last modified on 23 August 2013, at 14:07.